On a recent lunch break spent birding in Central Park rumors of both an early Blue-winged Warbler and an Al Levantin being present reached my ears. Now, it is easy to explain why I wanted to see the Blue-winged Warbler; I am a birder and birders want to see birds. But why did I want to see (and meet) Al Levantin? Well, in 1998 Al Levantin did what for many North American birders is a dream unfulfilled – he did a North American Big Year (seeing as many species as possible in North America in one year). And not only did he do a big year but it turns out that he did a big year at the same time as two other birders, and it turned out to be the biggest big year in North American Big Year history. So, of course, a book was written about it, The Big Year, by Mark Obmascik, which is now being made into a movie starring Steve Martin, Owen Wilson, and Jack Black. Corey: Has being one of the three birders in The Big Year changed your life in any measurable way? Al: The only notable change in my life was that people started asking me ” Are you the guy in the book” when I told them I was from Colorado. To this day people ask me to autograph their books. C: Now that a film is being made of the book have the requests for your time started to heat up? A: I’m not involved in the movie in anyway at present. The information that I have is all from the Internet. I’ve noted that they will start filming in Tofino, British Columbia the second week of May. A: I’m not 100% sure who will play my role but I’m leaning toward Steve Martin. C: How do you feel about the actor chosen for your role? Would you have chosen someone else? Who? A: The movie is a comedy and I’m very pleased to have Steve Martin play my part. If it’s Owen Wilson I’ll still be happy. A: The rivalry with Sandy was a bit overblown. Sandy and I were very friendly. The story about my overstating my count is accurate. Greg and I saw Sandy coming to the dock for one of our boat trips and we decided to have some fun. We gave him an inflated number and then Greg added that I had some easy birds that I was sure to get on the trip. Later we confessed. C: What was in the book that you hope might make it into the movie? A: My encounter with a Mountain Lion in Big Bend. My wife asked me not to hike up the mountain without someone accompanying me on the trip to find the Colima Warbler. On my return to the base I called her to advise that I was with a very slinky female with beautiful eyes that was truly athletic. To this day I’m sorry I didn’t get a picture of the lion, but needless to say I wasn’t thinking of pictures at that time. I followed the Park Service advice of raising my hands over my head and screamed at the lion. Fortunately it worked. C: A bird that is near and ear to my heart as someone who grew up in the Catskill Mountains is the Bicknell’s Thrush, and it is not mentioned once in the book. I assume you did see one during your big year, but where did you see it? A: Bicknell’s Thrush was one of my misses. I tried for it in Vermont and New Hampshire without success. The first Bicknell’s I ever saw was in Central Park and I saw another subsequently in the park. C: Will anyone ever break the record of 745 birds in one year in North America that Sandy Komito set? A: Sandy’s record will be very, very difficult to best because of not having access to Attu. To bird the island effectively you need 50 birders to cover the area over a prolonged period of time. Going for a few days would not be effective. Sandy had 4 weeks on Attu in 1998. Recently Lynn Barber of Texas did a big year and I believe she saw 723 species even though she spent a very considerable period in and around Alaska. C: What advice do you have for a hypothetical birder contemplating a North American (or even a state-wide) big year? A: My advice to anyone planning a big year is to do lots of studying and working out the logistics, since you need to be in my places during the migration period. One other suggesting is to be prepared to leave one area for another if a rare bird shows up in the ABA area. Local help is also desirable to maximize your time. Reading books by Sandy, Bill Ridell and Jim Vardaman gives you a flavor for what’s required and the areas you need to visit. C: What bird have you not seen in North America that you really really think you should have seen by now? A: The one bird I’d like to see is a white Gryfalcon. I’ve seen the brown versions many times but never the white. The other bird that frustrated me is the Blue Mockingbird which I always seem to miss by a few hours. There was a mockingbird in Arizona last year that I didn’t chase. C: Is there anything else you want to add? A: 1998 was a fun year and I always tell people to chase your dreams, which I waited 40 years to do. C: Thanks for the interview, Al. May you see both your Blue Mockingbird and white Gyrfalcon this year! *Since this interview was conducted it has been revealed that Steve Martin will be playing Al. 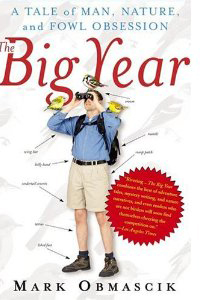 I just read “The Big Year” in the last month and loved it! How cool to meet Al on the birding trail and get this interview. Based on Al and Greg’s visit to Hollilynn Drive in Boise for Gray Partridge, I had to run out there and see the location for myself. I got a pretty good photo of a Chukar there and stopped in to visit the World Center for Birds of Prey which is right there. When my husband and I were hiking on Mt. Hood the other day, we saw fresh lion tracks in the snow. He said the way to contend with lions on the trail was to make ourselves big, just as you say. I said, “so, will I get on your shoulders and wave my arms?” He indicated he planned to hold me out in front of him. @Murr: Just remember, you don’t have to be faster than the mountain lion, just faster than your slowest companion. I lived in Colorado for a year and didn’t know where to find Rosy-finches. When I sent out a message for help on the local listserv, I got a message from Mr. Levantin himself, telling me that the Rosy-finches were at his house and inviting me over to see them. It was unbelievable. He’s a great guy and, obviously, an incredible birder. I enjoyed the book tremendously. I’ve birded with a woman who was at Attu with Sandy Komito, and now I can say I’ve birded with a guy who interviewed Al Levantin. All I need is a birder friend who has some connection with Greg Miller. I’m sure it’s there, somewhere. We can call it 6 degrees of The Big Year. It looks like a great cast has been chosen to play the birders in the book. I hope they do a good job with the movie, it should be fun to watch how the chase played out. In addition to the lack of access to Attu that Mr Levantin mentioned, another reason a year like that would be hard to achieve is the much more restrictive rules regarding airplane travel. One can’t just drop everything and take off at a moment’s notice anymore. Greg Miller is a friend of my wife and me. When he moved to southern Maryland before his Big Year, he looked up ABA members in the directory and Bell was the first one. I was in Florida for work at the time but he talked to my wife and when I got back, we hooked up with Greg. We’ve been good friends ever since. During 1998 he would call us at all hours of the day/night and ask what was being seen wherever he was. We had dial-up internet so we’d get on the net, write stuff down and call him back. Currently he’s in Tofino, BC and sends us daily updates on shooting progress. He’s been hired on as a bird consultant for the movie. Sounds like it’ll be quite funny. Jack Black is perfectly cast for Greg. We’ve met Sandy Komito a couple of times but need an Al Levantin sighting for the hat trick.